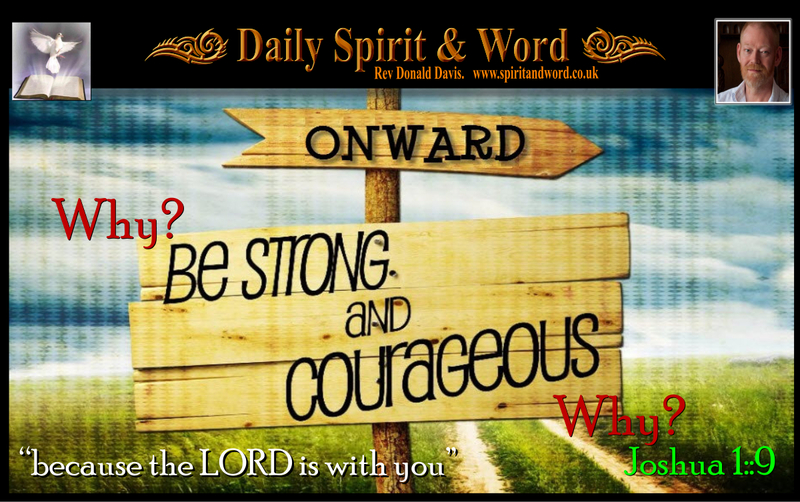 Daily Spirit & Word, 473: Be Strong and Courageous. Good morning my friends, it seems strange to me that the LORD would need to keep encouraging Joshua to be “Strong and of good courage”, because of all the people in the Nation of Israel, Joshua was probably one of the most courageous and strongest. Perhaps the LORD knew Joshua better than we do and outward appearances were not the same as his heart condition. Just look at how many times the LORD encouraged Joshua to be; STRONG and COURAGEOUS. “Be Strong and very courageous” Joshua 1:7. God knows each one of us intimately and what our fears and anxieties are, He knew Joshua better than he knew himself, but note the power of Joshua’s life, it was because he chose to spend time alone with God. Even after Moses had left the tent of meeting, Joshua remained in the tent with the Lord. The Lord is the strength of my life: of whom shall I be afraid? We are more than conquerors through him that loved us. Arise therefore, and be doing, and the Lord be with thee. Acts 4:13. Psalm 27:1. Isaiah 40:29-31. Psalm 73:26. Romans 8:31. Psalm 118:6. Psalm 44:5. Romans 8:37. 1 Chronicles 22:16. Joshua was very strong and courageous. Peter and John were courageous. Moses, Gideon, David, Elijah, Paul, James, Stephen; were all courageous. Because they spent TIME with the LORD JESUS CHRIST. And God was with them. Now, let’s get alone with Jesus and talk with Him, be with Jesus, soak in His Word, read and meditate upon His Word, pray to Jesus about your day, be strengthened and encouraged, be strong and courageous. Then you too will be very strong and courageous and the world will be ASTONISHED. He’s with you to the end my friends. I hope your Saturday is filled with great things from the LORD today.